"Family Guy" Remains No. 1 in the "kgb TV Standings"
NEW YORK, NY--(Marketwire - October 13, 2010) - "Family Guy" remains atop the latest "kgb TV Standings," which tracks the popularity of the new fall TV lineup based on the number of questions per show asked of kgb 542542 text answer service and kgb Answers at www.kgbanswers.com. "Dancing With the Stars" moved up two spots to No. 2, replacing "CSI," which fell out of the top 10 along with "Dexter." "Jersey Shore" jumped three spots to No. 3, followed by "Glee," which moved up two spots, and "South Park," which soared five spots. "The Simpsons" climbed two spots to No. 6, followed by newcomer "Gossip Girl" and "Supernatural," which dropped five spots. Rounding out the top 10 were "The Office," which fell two spots, and newcomer "Sons of Anarchy." Below please find the list of the top 10 most-talked about TV shows (in order) in the "kgb TV Standings," according to questions asked between Oct. 4-10. 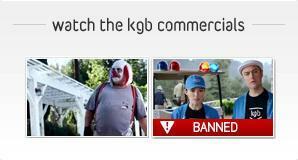 In addition to texting kgb for all your new fall TV lineup questions, fans can also visit kgb Answers at www.kgbanswers.com and check out the service's most-asked TV show queries for free on the site's television category page. Site visitors can search kgb's vast database of millions of questions and answers at no charge. kgb is featuring TV show content to showcase the extensive variety of questions users ask the service -- and the top-quality answers that kgb Agents research in response. What was the most watched "Family Guy" episode? Were Kelly Osbourne and Donny Osmond on the same season of "Dancing With the Stars?" What time is T-shirt time in "Jersey Shore?" Who does Iqbal Theba portray on "Glee?" Did Stan Mason have any more pets besides his dog Sparky on "South Park?" What other cartoons other than "The Simpsons" did Matt Groening create? The names of the television shows, character names and names of the cast members cited in this press release are referenced from actual questions received by kgb542542 and kgbAnswers.com during the past two weeks from television viewers across America and the inclusion of these names in this release does not constitute an endorsement of kgb or its products and services by the television networks or the actors and actresses mentioned in this press release. In one of kgb's TV commercials, a Sumo champ demonstrates how kgb's quick, accurate answers are better than pages of links.